In my last post in this series, I wrote about the Monergistic Work of the Holy Spirit in the process of Sanctification. In this post, I will talk about how we work alongside the Holy Spirit to bring about change in our lives. 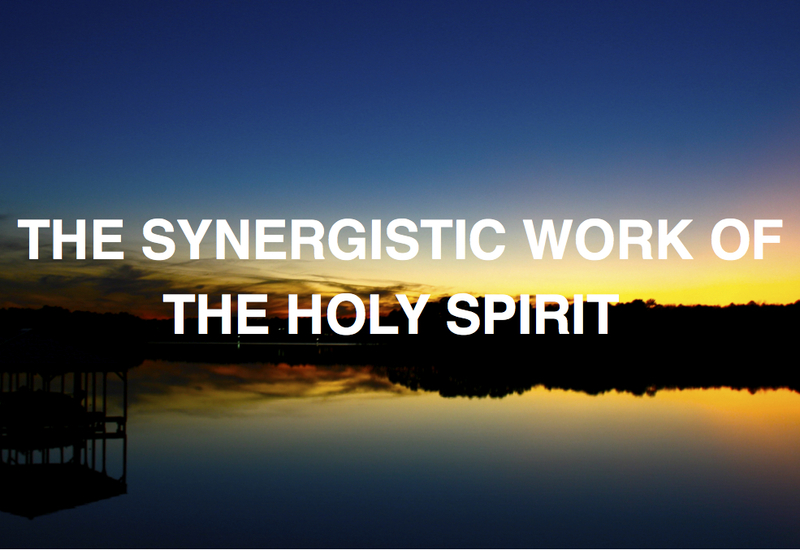 The Synergistic Work of the Holy Spirit refers to how we and the Holy Spirit work together to bring about change in our lives. In order to understand how we work alongside the Holy Spirit, we need to look at the concept of Dependent Responsibility. We cannot change on our own apart from the Holy Spirit. That’s because change only occurs in us as the Holy Spirit lives in us and gives us the power to change (Ezekiel 36:27; 1 Cor. 6:19; John 15:4-5). The Holy Spirit’s empowering doesn’t absolve us from work. Rather, it means we must depend on the Holy Spirit to enable us to do God’s will. We don’t let go and let God as some say. Instead we work alongside God as He is empowering us to work . If you notice, in each verse the reason we can work out our own salvation and the reason we can do all things is because God works in us and strengthens us . So, while it is our responsibility to work, we couldn’t work unless God was working in us and empowering us to work. We are responsible, yet dependent at the same time. How Does This Work Out Practically? In this verse, Paul gives us a command. He commands us to “be transformed by the renewal of [our] mind.” The command Paul gives isn’t in the present tense, instead it is given as a passive imperative. What does that tell us? It tells us that while we are commanded to be transformed, we must rely on someone else to do the transforming. The person we rely on is the Holy Spirit. But relying on the Holy Spirit to transforms us doesn’t mean we don’t work. We do work. We work by depending on the Holy Spirit and by reading God’s Word. So, if we want to be transformed, we must read God’s Word. Other ways we work is by attending worship services, praying, gathering with Christians in community, etc. As we do all those things, we not only depend on the Holy Spirit, but He also works to reveal our sin, convict us, and empower us. So then, we see that we are responsible to be transformed, but transformation doesn’t occur through our effort alone. Instead it occurs as we work alongside the Holy Spirit. As we depend on Him and as we practice the spiritual disciplines (reading God’s Word, praying, attending worship, gathering with Christians in community, etc). When we do those things, when we work alongside the Holy Spirit in those ways, He exposes our sin, convicts us, and gives us the power to turn from our sin to live like Christ. Dependent Responsibility is a term coined by Jerry Bridges in The Transforming Power of the Gospel, kindle location 196 (ch 1) and 1530 (ch 8). Jerry Bridges, The Transforming Power of the Gospel, Ch. 8-11. Will You Celebrate on Judgment Day? Thanks for reading and thanks for your encouragement.